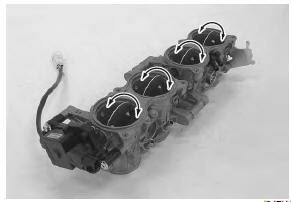 Refer to “throttle body removal and installation” . identify the position of each removed part. Organize the parts in their respective groups so that they can be reinstalled in their original positions. 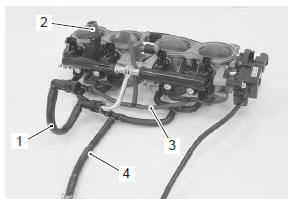 Disconnect the fuel feed hose (1), isc valve hose (2) and vacuum hoses (3). Remove the fuel delivery pipe assembly (5). be careful not to twist the fuel delivery pipes and t-joint (6) when removing them, or joint part “a” of the fuel delivery pipe get damage. 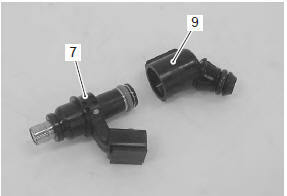 Remove the primary fuel injectors (7) and secondary fuel injectors (8) from the fuel delivery pipes. 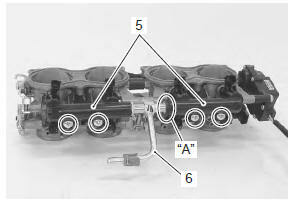 Remove the fuel pipe (9) from the primary fuel injectors (7). Remove the t-joint (6) from the fuel delivery pipes. 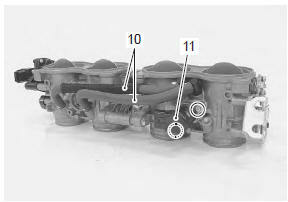 Remove the isc valve hoses (10) and isc valve (11). 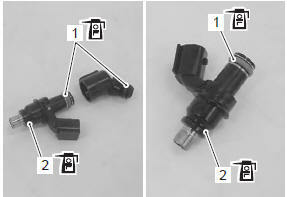 Remove the tp sensor (12) and stp sensor (13) with the special tool. prior to disassembly, mark each sensor’s original position with a paint or scribe for accurate reinstallation. never remove the stva (14) from the throttle body. 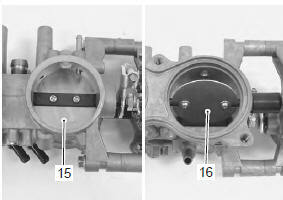 never remove the throttle valves (15) and secondary throttle valves (16). 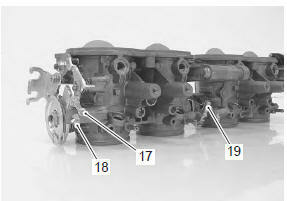 these adjusting screws (17), (18) and (19) are factory-adjusted at the time of delivery and do not turn or remove them. Do not separate the throttle body. 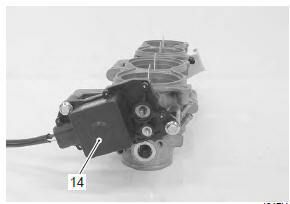 with the secondary throttle valves fully opened, install the stp sensor (black) and tighten the stp sensor mounting screw to the specified torque. apply thin coat of engine oil to the o-ring. 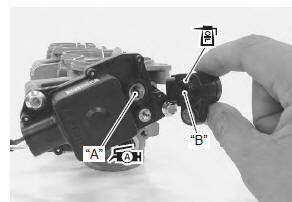 Align the secondary throttle valve shaft end “a” with the groove “b” of the stp sensor. 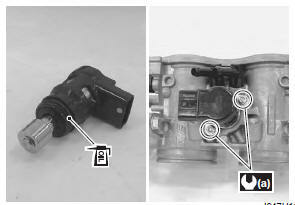 Apply grease to the secondary throttle valve shaft end “a” if necessary. make sure the secondary throttle valves smoothly open and close. If necessary, adjust the stp sensor. 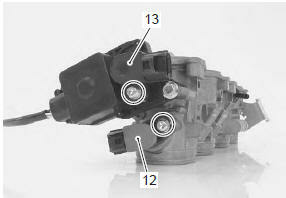 Refer to “stp sensor adjustment” in section 1c . With the throttle valves fully closed, install the tp sensor (gray) and tighten the tp sensor mounting screw to the specified torque. 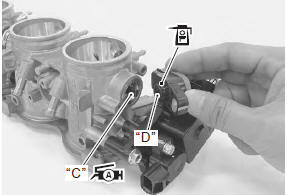 Align the throttle valve shaft end “c” with the groove “d” of the tp sensor. Apply grease to the throttle valve shaft end “c” if necessary. make sure the throttle valves smoothly open and close. If necessary, adjust the tp sensor. Refer to “tp sensor adjustment” in section 1c . Apply a thin coat of engine oil to the o-ring, install the isc valve to the throttle body and tighten the isc valve mounting screw to the specified torque. Apply thin coat of engine oil to the new o-rings (1) and cushion seals (2). replace the o-rings and cushion seals with new ones. 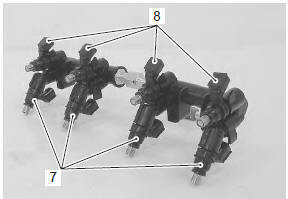 Assemble the fuel delivery pipes so the t-joint is set in proper angle as shown in the figure. be careful not to twist the fuel delivery pipes and t-joint when installing them, or joint part “e” of the fuel delivery pipe may get damage. Install each fuel injector by pushing it straight to the delivery pipe. never turn the injector while pushing it. 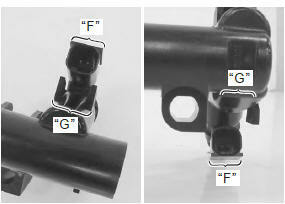 align the coupler “f” of injector with boss “g” of the delivery pipe. Install the fuel delivery pipe assembly to the throttle body. Tighten the fuel delivery pipe mounting screws to the specified torque. Connect the hoses properly. 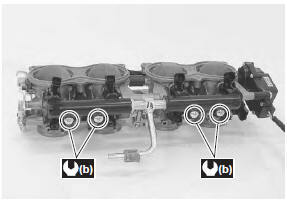 Refer to “throttle body construction” .